Paul’s New Year’s Resolution: Don’t Get the Gardener Mad! Last month, Paul wrote about my comment several years ago that “America is no place to get old in.” In that article, he stated, “Costa Rica, on the other hand, is a great place to get old in. And for all the right reasons — civility, caring, respect, and relatively inexpensive health care.” We see evidence of this all the time. It’s the way people talk about their parents and grandparents, with respect instead of annoyance. Costa Rica also has the Ciudadanos de Oro (golden citizens) program which they established in 1997 to create a culture of dignity and respect for the elderly. We recently saw more proof of this on the back of a public bus near the Airport. I think this photo says it all. 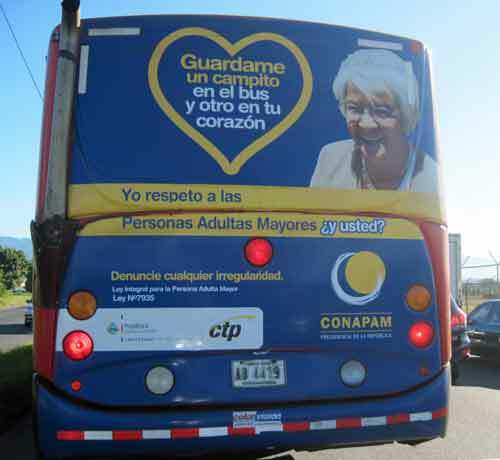 The text inside the heart translates to, “Save me a seat on the bus and another in your heart.” And the text below says, “I respect the elderly. And you?” This is followed by the legal code that deals with this issue and a request for people to report any infractions they witness. Can you see this happening in today’s U.S.? Paul’s Monthly Tip to Live for Less in Costa Rica: The Gold Card-Don’t Leave Home Without It!